View all products by Glacier Soap Co. Experience the smooth, creamy feel of an ultra moisturizing soap while enjoying the convenience of a pump. No more mess! Glycerin; natures best kept secret – the ultimate ultra moisturizer. Glycerin is a humectant, meaning it attracts moisture to your skin. 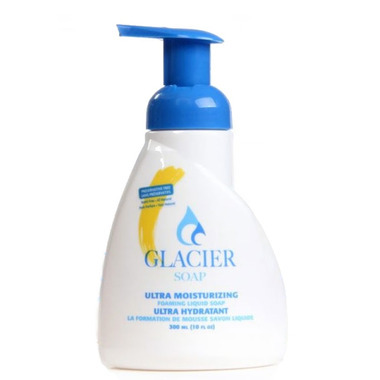 Combined with luxurious smoothing coconut, castor & avocado oils; Glacier Soap’s Ultra Moisturizing Foaming Liquid Soap offers the eczema and rosacea sufferers quick relief. Gone is the “alligator” itchy skin. Glacier's Liquid Soap uses 100% all natural ingredients. With no scents, preservatives or parabens, all of their products are hypoallergenic and safe to use for all skin types. This is the one and only soap that NEVER irritates the at times very severe eczema on my hands. I love this soap and buy it in bulk when it goes on sale at Well so I'm never caught without it. It has zero fragrance, and is a gentle foam that leaves a moisturized feeling after you rinse. Not greasy, it's just not stripping, and feels so soft on your skin. I love that it's so pure, I can let me daughter use it (she's 3) and not worry about chemicals or stripping her skin of moisture. The pump is easy enough she can manage it herself without help.